It is no secret that I love Lindsey Stirling because of her layering of a classical instrument over electronic music that creates a great old-meets-new feeling. 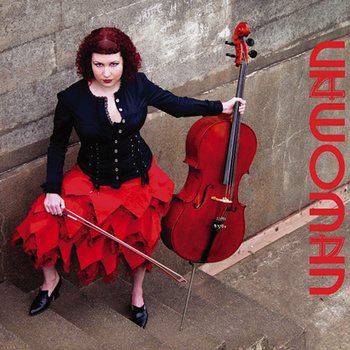 Unwoman is another such artist, and her instrument of choice is the cello. I didn’t find out about this amazing singer-songwriter-badass cellist until after I left the San Francisco Bay Area, but after my stint abroad there is a good chance I will end up back in Northern CA once again, so maybe I can get a chance to see her in concert after all. She has several albums available on her bandcamp page, but meanwhile you can enjoy the video below. This entry was posted on November 13, 2014 by Phoebe Darqueling. It was filed under Entertainment, Music to Steampunk by, Performing Arts and was tagged with cello, Music, steam punk, Steampunk, Unwoman. Unwoman is a regular at Clockwork Alchemy, the steampunk con over Memorial Day weekend in San Jose. I discovered her cover of “The Muppets Show” theme on Halloween and found it to be appropriately eerie. never seen a cello vocalist before!